The U.S. Consumer Product Safety Commission (CPSC) and IKEA have announced a voluntary recall of their PAX AURLAND wardrobe mirror doors. 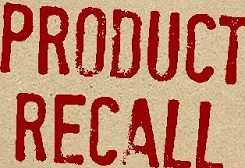 The recall affects approximately 1,700 units in the United States and about 500 in Canada. It has been discovered that the mirror doors, imported and sold by IKEA North America Service, can detach unexpectedly from the wardrobe door, and fall and shatter. Obviously, this poses a laceration hazard to consumers. This recall involves a wardrobe door with full-length glass mirror with model number 101-604-51, supplier number 12650 and production weeks 1039 through 1048 (YYWW). The product name “PAX AURLAND” and “IKEA” and production week are printed on the rear of the mirror door on the lower edge. The mirror door is made of foil-coated particleboard and the mirror of glass. The mirror is secured with metal fastenings at top and bottom. The mirror door measures about 19 and 1/2 inches wide, 93 inches high and 7/8 inches thick. IKEA has received reports of 14 incidents. Customers are urged to conact their local IKEA store for instructions on returning the mirror wardrobe door for a free replacement door.